There are a number of interesting boutiques, from Redeux Market, an antiques and collectibles store, to Memory Lane Sweets, a candy store specializing in nostalgic candies. Although not technically a boutique but continuing the theme of harking back to earlier, simpler times, is Timeline Arcade, which specializes in arcade games of the preceding decades. There are lots more to be found in York than the places I mention below, but these provide a good start to filling your day! The nostalgia is as sweet as the candy at Memory Lane Sweets. This boutique candy shop features treats that will bring you back to your childhood! From Necco's Candy Buttons to Root Beer Barrels, Pixy Stix and Goetze’s Caramel Creams, there’s sure to be a treat for everyone. According to Mikey Shirey, the founder and owner of Sweet Memories, nostalgic candy is popular because of the memories attached to them. "Customers will remember a time of visiting a loved one who may have had a dish of a certain candy, or they see a favorite candy bar they had when at a local swimming pool or would eat during their lunch break from school," she said. "All of these memories are of a much simpler time and bring such joy to relive them when they see their favorite candy." In fact, visiting her boutique brought back memories of my Nana and Baba bringing pages of Candy Buttons when they drove down from Jersey City to spend a week with us in Frederick, MD. The most popular candy in the boutique is the mix and match candy. "There are many nostalgic candy to choose from, mint juleps, root beer barrels, Necco wafers, all sorts of licorice -- the list goes on and on. Other candy would be Clark bars, Whistle Pops, Zagnut bars, Candy Buttons, Bun Bars and so many others," she said. Shirey's candy boutique grew out of her memories -- sweet memories -- of her childhood. "One of our fondest memories is running to the store with our nickels, dimes -- whatever we had -- and walk away with a little brown bag of full of Swedish fish, tootsie rolls, sixlets, anything candy!" she said. A 30-year resident of York, about 3 years ago she realized that vintage-style candy shops don't exist anymore, and that she could fill that gap. " I wanted to bring back memories for those who lived it and create memories for those that never had the experience. My customers are loving it!" she said. Shawn and his mom are making their own soaps at Sunrise Soap Company. One of York County’s favorite factory tour locations, Sunrise Soap Company should be a stop so you can try making soaps yourself. Pick out scents, colors and shapes, and they will walk you through each step along the process. While your custom soaps are curing, browse the store's self-care items. All soups, fizzies, and bath bombs are made onsite, and depending on what they're making that particular day, you can see the soaps being made. You can also make bath fizzies, lip balm and more. When you step through the door of Timeline Arcade, you enter an epic world of classic arcade games -- think Pac-man and Galaga, Superman, and Joust -- as well as all of the latest game consoles. For a few moments, the 1980s child in me reveled in the games, even though all we were doing was walking past them (we vow to return). Pin ball fans will appreciate the selection of pin ball machines from the 1980s and 1990s. Although not technically a boutique, I recognize that browsing boutique and antique stores can make you hungry, so why not stop by York Pretzel Company for hand-twisted Bavarian pretzel, and to watch a pretzel being twirled? Even if you're not browsing the boutiques, go to York City Pretzel Company anyway. You haven't had a soft pretzel until you try one of theirs -- it's that good. This coffee shop and art and thrift boutique is the perfect introduction to Downtown York. Start your day with coffee and roll as you browse the sculptures, paintings and other art found in this trendy shop in the city’s WeCo neighborhood. We made this our first stop, picking up a hot cup of joe -- but we could have had a hot chocolate, expresso or latte -- in a variety of flavors. After we munched on our breakfast roll and sipped our coffee -- made just the way we liked it, by the way -- we headed upstairs to browse the rest of the store, enjoying the eclectic selection of art and collectibles/antiques. I kind of wanted this couch! I-ron-ic is also the home of York’s pedi-cabs. Visitors can book one to get around Downtown York in an unforgettable way! A little further away from the other boutiques, in the Royal Square District, is Redeux Market. Although it's described as a "second-hand marketplace," think of it as curated vintage goods, including apparel, antiques, and even handmade jewelry. It's a modernized antiques mall, with trend-setting merchants who have hand-picked collections of high quality, vintage goods and apparel. 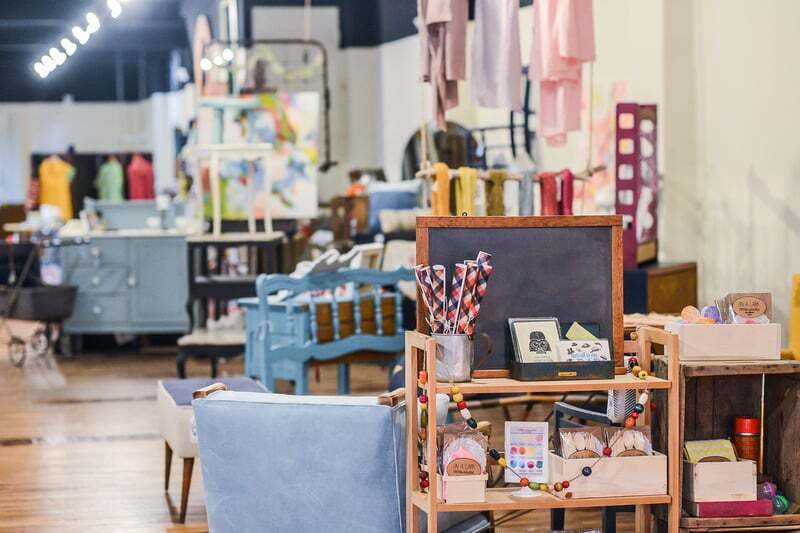 What I appreciated about this store is its selection of its really cool, affordable and eclectic items, fitting in a store located in the heart of "artsy York" in the Royal Square Arts District. Some items may hark back to other periods, but items from the 50s, 60s, and 70s dominate the store. 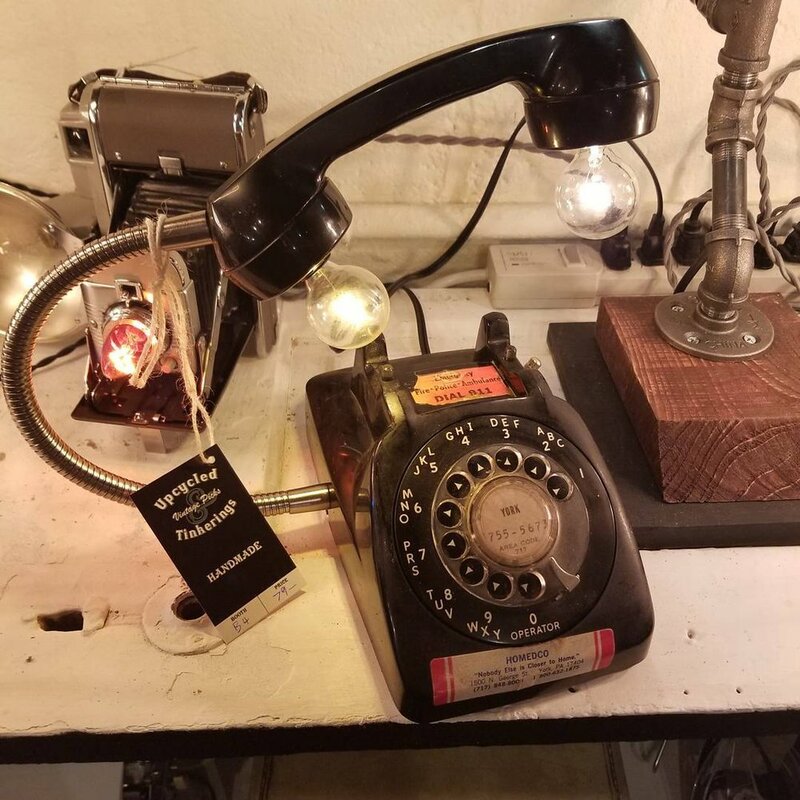 We browsed in the store, just to get a sense of what the store has to offer, and ended up walking away with a cool vintage blue (sparkly) necklace and a neat metal floor lamp that spoke 1970s to me.